Moses’ second descent from Sinai is much different from the first. This time he has two new tablets and a changed complexion: the skin of his face is “shining” (from Heb. qrn) because he had been talking with God. The use of qrn here is odd since it usually means “horns,” not “to shine,” as depicted in Michelangelo’s statue of Moses in the church of San Pietro, Rome. 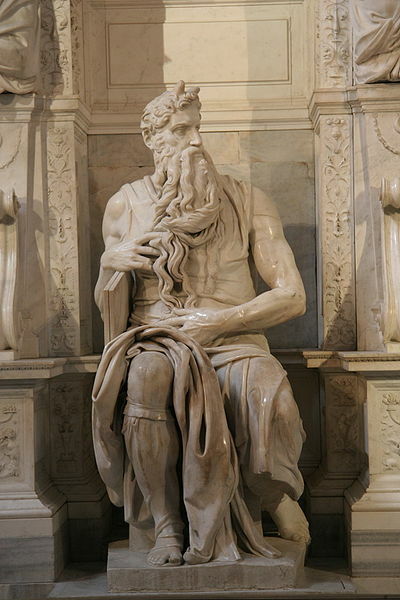 Michelangelo based his depiction of Moses on the translation of qrn in the Vulgate (“he knew not that his face was horned“). Scholars differ on the interpretation of qrn in Exod 34: Jirku (“horns”), Propp (“disfigurement,” or blistered skin), Sasson (“horns”), Stuart (“rays”), Sanders (“light”), Cassuto (“rays of light”), Childs (“rays of light”), Enns (“afterglow”), etc. The LXX has, “the skin of [Moses’] face had become glorified.” Paul follows the LXX: “The Israelites could not look steadily at the face of Moses because of its glory” (2 Cor 3:7).